The “Sunny Day” original is warm, summer tinged tune with a pleasant groove and nice vocal samples. The lovely melodies peak with gorgeous cascades of keys getting intertwined with soft textures for a nice emotional vibe. The second track “Empty Metropolis” is darker sounding piece with moody tones and deep vibe that going to be amazing on the floor. The EP concludes with “Night Walk” which is the deepest and most delicate sounding piece on the EP. It seems like the ideal track to conclude the release with its airy textures, warm bass stabs and poignant keys. 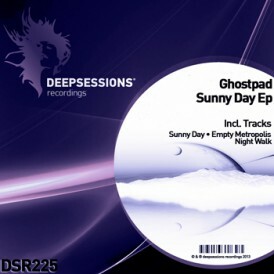 A fabulous EP from Ghostpad and a great release again from Deepsessions.